Previously I wrote about some large cap scripts I would prefer to accumulate during the panic. Here are some mid-cap and small cap scrips which I am accumulating. It is somewhat easy to analysis and rely upon large/ blue chip companies, but with mid-cap and small-cap it is quite difficult. And I heavily rely upon for Equitymaster’s recommendations for such scrips. Equitymaster has always been valuation-based and reasonable in their predictions. However, during the bull market their some of their predictions was known for achieving target within a week. But now things are different and Equitymaster and Ajit Dayal seem right in their approach. Equitymaster has posted their review on 01-10-2008 about most of their all recommendation and they are firm and positive about the future. Followings are some of Equitymaster recommendations I am watching/ accumulating. Jagran Prakashan : It was recommended in 91, now it near 71, and target is given of 120 for 2010. Paper Product : Recommended at 51 , now 38 with target of 83 for year 2010. Good dividend yield as well. Praj Industries : Recommended at 180, now around 126 with target of 250. Gujarat Industrial Petro. (GIPCL) : Recommended at 60, now around 60 with target of 120. Good dividend as well. However, recent announcement of Gujarat Government about donating 30-40 % of profit of state run government companies is dampening factor. No doubt small caps have much potential to grow and therefore Warren Buffet is also like small companies. However, investment in small companies is highly risky, and small caps run once in a decade for cats- and-dogs as it happened in last bull run (RNRL, TTML etc. ), so don’t expect that kind of return in short period. These recommendations have target period of at least of 4 years. Parekh Alumniex (PARAL) : Recommended in 175, now around 100 with target of 595. Srei Infra Finance : Recommended in 150, now around 60, with target of 450. Compact Disc India (CDI) : Recommended in 82 , now around 39 with target of 320. Ashai Songwon : Recommended in 39, now around 30, with target of 200. Elgi Equipments : Recommended in 44, now around 41, with target of 154. DISCLAIMER : I may have and will have some interest in the scrips mentioned herein, and this is not recommendation to buy. Today , when the market opened I saw Mercator Lines (MLL) at around38-39 and thought to add little in the bulk. So, I called my broker for placing the order, he symptomatically alerted me, “be careful, now it is bear market ahead”. I smiled myself and thought now the fact has been realized to the lowest level. Ordinarily, brokers rarely advise you ‘not to buy’, not because they are losing commissions , but morely because it is our decisions to do so. But when a broker whispers about bear market, it is clear that ‘the last bull’ also has lost confidence in the market. So, what will happen next? The valuations of all companies become zero? They will become bankrupt? Civilisation will extinct? The answer is, after all these ‘Fear Factors’ , things will become normal- people will again find valuations attractive in the same companies for which there were no buyers in the days of panics.- Again some people will buy selected scripts- again they will become optimistic about the growth of economy- and they will buy some more- and that will increase stock prices- that will alert some other investors about the rising prices of shares, so they will try to get into the market expecting good return- that will also cause rise in prices of shares- by now Televisions and newspapers will take notice and make headlines about unusual price rise of share prices- which will create ‘Greed Factors’ among the mass…. and you know what will happen next. It is correctly said that we have learnt from history that men never learn from history. So, till the human beings are there with there primitive emotions of fear and greed, bull and bear market will survive. After the recent panic it has become clear that people are fearful and are not able appreciate the valuation of many shares and dumping in panic, which is creating situation that many stocks are below their book values and making many scrips attractive in long term. Of course, it cannot be said that market has bottomed up. P/E of NIFTY has reduced significantly at 15, which makes it somewhat inexpensive for long term. But on account of panicked sliding, market may still slide arond 3000/10500. However, long term investor should buy in small quantity instead of waiting to identify the bottom, which sometime cause to miss the reversal/bottom point. Sometime it happens that while waiting for identifying the bottom and confirmation reversal cause precious opportunities. However, in my experience it is difficult for individual investor to keep close check on the market and therefore should do not worry about missing bottom. So it is time to do some research and keep eyes open for opportunity. Few of my favorite scrips trading very attractive prices. The bull run in Indian stock market from 2003 onwards made species of long term investor almost extinct, until now. After the significant fall in the market since January’2008 it has become clear , at least to the sane investors, about the downtrend in coming 2-3 years. Ordinarily, experienced traders/investors consider 15% average annual return (compounded) on the investment as optimal. Although it seems easy during a bull run when such return is possible during a single trading day for many scrips. However, when investments are calculated in longer term 15% is average return. 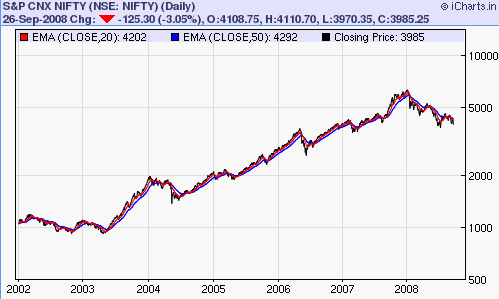 NIFTY Shows return of nearly 500 % during the bull run from 2003 to 2007, reaching from 1000 points to nearly 6000. Now it appears to be time for discounting, and perhaps there is still much left to discount. I am not capable of forecasting the exact bottom of NIFTY in time to come. But if we calculate theoretically , from 2003 onwards if NIFTY would be increasing at average 15% annually, today it should be somewhere between 2100-2400. As suggested by Morgan Stanley that India is in a classic cyclical slowdown: , and global earnings are decreasing , it is possible that market may go low as much as 3000 or below that, assuming it is classical slowdown cycle. Read about the interesting and brief description of major trends i.e. bull and bear , of stock market by Robert Davis Edwardsand John Magee in their bibical book,Technical Analysis of Stock Trends (Read the page no. 18 and 19 in limited preview of Google Book Search). Read another interesting article on Stock Market bottom and approaches for identifying market bottom from Wikipedia. Consistent five trading day in upmove has reversed the trend. Weekly chart of NIFTY clearly shows the uptrend and with many other indicators in that direction. Positive Break out : From02/05/2008 to 18/07/2008 the NIFTY showed consitent downtrend and thereafter it gave positive breakout above the resistance line and closed above the line. ADX indicator (Average Directional Index) (?) : ADX line was at near 58 in January’08 when the recent fall started. ADX line was in continuous getting lower and presently at the lowest (21). Ordinarily when ADX indicator is below 25, it is good to avoid trading. However, the ADX indicator is at 38 on daily chart , but gradually lowering, implying loosing of strength of the trend and consolidation for some time. The ADX line is also moving below both the DMI (Green and Red) lines , which also suggest to avoid trading. The green line in the ADX indicator implies positive direction movement indicator (+DMI). Surprisingly the green line started decreasing as early as in October’07 and went as low as at 9 during April’08. Thereafter it has started upside movement and at presently at 21. Ordinarily when the green line is moving up with rising ADX it is bullish sign, but presently ADX line seems to crossing below the green line which makes the situation little bit clueless. Elder’s Ray (? ): With the last week upmove, the bullish power on Elder’s Ray has gone above zero, in positive, at 86. However, on the weekly chart this upmove is not significant one. But on the daily chart the bullish power went upto 360, and it was highest on one year frame. If bullish power goes above zero, and makes the higher high , it is buy signal. Relative Strength Index (RSI) : On the daily chart RSI went upto 60 in the recent move and now it is falling. But on the weekly chart , it touched to its lowest after the fall , to 32 and now it is rising. Return of bulls in Indian Stock Market ?! Well, no one is sure about it. But after the historical massacres on 21st and 22nd January ,which shaken all the trust and confidence of the investors, it was difficult to hope for a recovery. The recovery seems arrived sooner than expected. Today ,not unlike Monday and Tuesday, the Bombay Sensitive index made another historical record ,in a pleasant way , by the way of gaining about 1140 points (6.62%) in a single day. Technical analyst were expecting a bounce back. 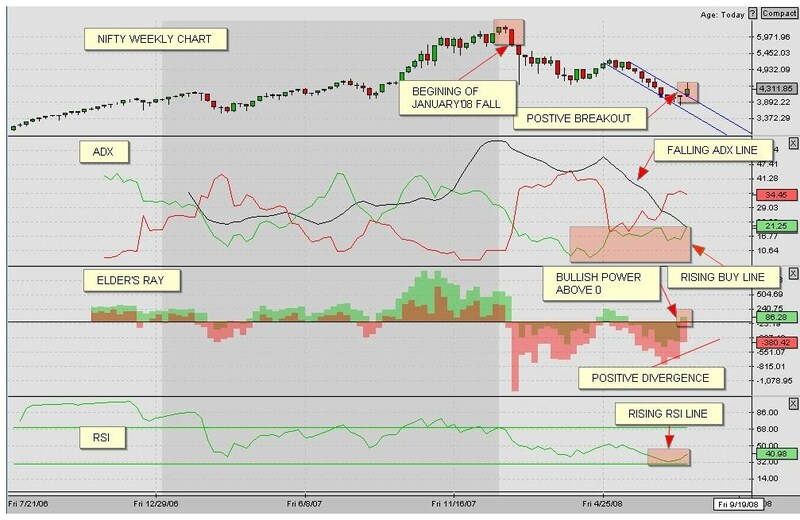 During mid January’08, RSI (Relative Strength Index) indicated overbought situation and also showed negative divergence. Therefore, some sliding towards the centerline was expected. However, the sudden huge slide for two consecutive days brought the market in oversold situation. After today’s rise, RSI indicates positive divergence, hardly keeping the nose above water,at around 35. So, looking to the buoyancy displayed by the market, bull run seems in order , of course, subject to the global cues and other factors. I am publishing this post in the answer of Sudha’s query about the price target of RNRL, which I have been occasionally asked. About RNRL I am as clueless as most of people , about the business of the company. The business profile on the official website (as on 24-11-2007) of the company remains silent about the business . What general public knows about the it is that the company become demerged during the dispute between the Ambani brothers resolved and shares of of RNRL having face value of Rs.5-00, were issued to the share holders of at the premium of Rs.35-00. While the demerger RNRL entered into agreement with RIL for supply certain quantity at certain price for a certain period. However, there is prolonged dispute between the brothers about the terms of the agreement and it is pending in the court. (See news 1 2 3 ) So, unlike RPL , RNRL has no fundamental footing to work on. If you check the financial of the company you will find RNRL as one of the most expensive stock in the front line stocks. Against the huge share capital of Rs.736 Crore , quarterly turnover is 63 crore and net profit is 19 crore. Therefore, at given EPS of 00-27 paisa, price earning ratio is whopping 585 at the market price of Rs.158-00. In June’07 it clearly breached the level of 30 and moved up smartly without any downside till mid September. On 21-09-2007, it gave a unprecedented single day price hike in the history of Indian stock market from moving 56 to 76 and on next trading day on 24-09-07 it closed on 93. Such sudden price hike drew attention of many investors and thereafter RNRL was on dream. People was expecting hikes of Rs.10-20 everyday and speculating price of 300 soon. But after hitting life time high 198-00 (203-00 on BSE) it followed the law of gravity and fall down but not significantly. Following chart will help you to under the price movements graphically. It is very exciting to see the price movement of RNRL on screen, but there is nothing fundamentally to justify all these price hikes. It is difficult to set any price target for this script as it is already hyper-overrvalued, and therefore it is strongly adviseable not to invest at this price unless you have long time horizon and some risk appetite. If you are already invested at high price you will definately see your purchase price looking to the recent reversal up trend. However, every upward movement will be faced with profit booking and it may take some time to cross the life time high. Disclaimer here, I have invested some good amount in RNRL at average of Rs.22-00 and I have become greedy as I am getting thundering 700% return and I have very deep (highly unlikely) stop loss and I am staying invested. Probably sell 10% stake at 220-00 take back the original invested amount. Last year when I started accumulating Reliance Petro (RPL), I wrote about my expected returns. I was expecting 20 to 30% annual growth but ,pleasantly, my expectation fall short compared to the bullish run of RPL. From June’06 to mid March’07 RPL was bouncing between the narrow range of 68-72. 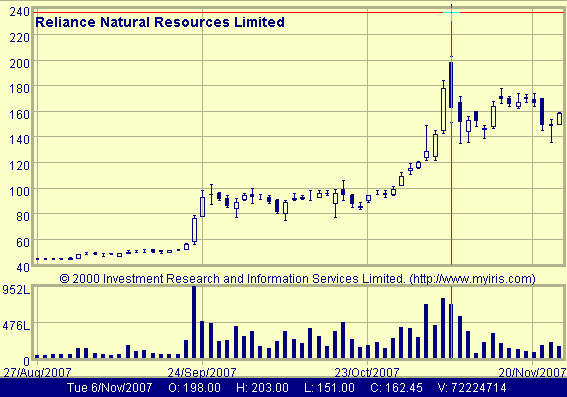 On 23-03-2007 it broke the upper limit to Rs.75-00 and thereafter it has not looked back. Withing three months, in June’07, it reached the psychological upper limit of Rs.100-00 and it was tempting to sell some of holdings as it was giving handsome returns of about 50% on my average purchase. Eventually my greed ruled over the decision to partial profit booking. Again, I waited watching RPL to climb point by point and consolidating well between 105-115 before it reached to 120-00. I was comforted about my decision to hold as RPL did not give any good opportunity to buy at lower price. (However it reached to 96 level, but considering the commissions, other charges and capital gains there was no room for any profit). RPL showed another positive sign during the recent sub-prime triggered crash, that it did not go below 105-00 , that is too for once or twice and showed upsurge as soon as the market was out of the panic making new highs. From the first trading day of September’07 it started moving from 116-00 and the close on 20th September was 138. However on next day , 21-09-2007 it opened at 139-00 and went to the high of 158-00 closing at 155-00 providing some 130% of annual returns. RPL has special place in my portfolio, as 25% of funds are allocated to it and therefore change of Rs.2-00 gives 2% of return on entire portfolio. Some may think that I am over invested in the particular script, yes I am, but thankfully my gamble turned out to be safe. Now about the future prospects , everybody has wild guesses about it. However, some expert recommends to book some profit now. But I plan to hold it more and my first sell probably will take place soon before the production starts in the end of 2008 ,if nothing extraordinary happens in between. Some people worry about the merger of RPL with Reliance Industry (RIL). However in my view there is not much to worry as in case of the merger still the management remains same. My guess is that RPL will move upwards till the production date, as people are buying with high expectations of splendid earnings. So until the production does not start the expectations will fuel the price and as there will be hardly anything to effect the price , except the announcements about how soon the refinery will start. But after the production a factual picture will emerge and earnings and profit will effect the price growth. Looking to the pace , I believe the price will reach to 250-00 if not more, by Dec’08 , or earlier of the production commence earlier than that. If it reaches , somehow, to 300-00 I will sell 20% stake to encash my original investment. Everyone was watching closely the Fed Reserve , the Central bank of US, to take decision on the lending interest rate to other banks. Pleasantly, for market traders, the Fed reduced the interest rate from 5.25 % to 4.75% and Dow Jones reflected the decision by closing some 2.51% higher than the previous close and other Asian markets followed the trend. However, the question still remains whether the interest cut is appropriate to remedy the sub-prime fever in US. Wikipedia explains ” Sub-prime lending is the practice of making loans to borrowers who do not qualify for the best market interest rates because of their deficient credit history”. Many major banks of US , Europe and Asia were directly or indirectly involved in sub-prime and suffered heavily. The present interest rate reduction is to help the banks to obtain money from the central bank at lower rates. Most of bankers has appreciated the cut. But there are still some concerns about the cut. Read the article by Ajit Dayal explaining the sub-prime issue. In the next article he is concerned about the interest cut. Can any central bank allow its larger banks to fail or be in trouble? Well, under Paul Volcker, the Fed Chairman in 1980 it was possible. Citibank nearly sank and its stock price was US$ 1 and priced for bankruptcy before the famous Saudi investor (Prince Alwaleed bin Talal) rescued it. But Paul Volcker was a bartender from the days of the black and white movies. Like our own V P Singh, he did not care for the might or reputation of anyone. If you made some silly financial bets and you were wrong, Mr Volcker let you suffer for it. When the US was going through a housing boom in 1980, Mr Volcker did what all central banks should do – he cut that boom to size by raising interest rates to 21% (yes, 21%) in USA. That killed the demand for housing, hurt the US economy big time, killed any inflationary pressures but probably laid the ground for the next, largest and most sustainable expansion in the US economy. By raising interest rates, banks went bust, home building companies went bust, Wall Street was dead. Mr Volcker kept on chewing his cigar and kept on throwing the drunks out of the bar.